They're incredible-and also incredibly creepy. Imagine ringing a doorbell and waiting for someone to come to the door when a 6-1/2-foot tall robot kangaroo comes rolling over the threshold, zips down a flight of stairs at nearly 10 mph and then down a snowy hill and into the parking lot behind you. Yes, this is the thing nightmares are made of. Except this is no kangaroo. Its name is Handle and it is 100 percent real. In case you’re unfamiliar, Boston Dynamics was born out of MIT in the early 1990s and has since developed a small army of quadruped and biped robots that have captured the world’s attention and imagination. 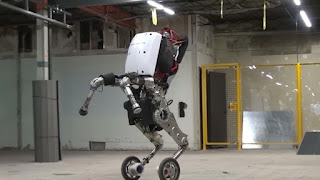 Google acquired Boston Dynamics in 2013 and was housed within the Google X research and development lab, known for its far out, “moonshot” projects. As it turns out, Boston Dynamic’s creepily walking robots were too far out there. It was reported last year that Google put the company up for sale, unsure that it will produce a marketable product anytime soon. Marketable or not, Boston Dynamic’s robots are incredible—perhaps incredibly frightening as well. Here’s a look at some of the other crazy robots in the company’s arsenal of creations. Hopefully they’re not on standby, waiting to take over the world. Development of the original BigDog robot was funded by DARPA with the idea that the rough-terrain robot could serve as a pack mule for U.S. soldiers in the field. As improvements were made, BigDog was reincarnated as the LS3 and was being considered by the U.S. Marines. But the Marines backed out in 2015. "As Marines were using it, there was the challenge of seeing the potential possibility because of the limitations of the robot itself," a military spokesperson said at the time. "They took it as it was: a loud robot that's going to give away their position." Another DARPA-funded project, Boston Dynamics says Cheetah is the fastest legged robot in the world, surpassing 29 mph. Go on, watch Cheetah run. Atlas stands at 5’9” and weighs about 180 pounds. We can get you his phone number, if you want. We bet he's a great conversationailst. Related: No Bull! This Robot Could Put Cowboys Out of Work. Yep, that’s a robot dog trotting around a house. Not weird at all. Promise. Six independently controlled legs give the RHex the ability to easily climb in rock fields, mud, sand, vegetation, railroad tracks, telephone poles and up slopes and stairways, Boston Dynamics says. In other words, it’s a robotic insect that looks like its hopped up on amphetamines. Awesome. This guy’s job is to test chemical protection clothing in more-or-less realistic conditions. Except, it’s not a guy at all. Petman is an anthropomorphic robot. Looks like he’s got all the right moves. RiSE uses feet with micro-claws to climb on vertical, textured surfaces like walls trees and fences. If it could shoot webs (and had two more legs) I’d call it Spider-Bot.